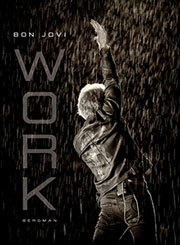 "WORK" is a rare, behind-the-scenes look at Bon Jovi, the top touring rock band in the world. This oversized, hardcover art book - weighing nearly five pounds - is a collection of color and black and white photographs taken by the band's official tour photographer David Bergman during two record-breaking world tours from 2010-2013. Exclusive, intimate, and powerful images of Jon, Richie, David, and Tico show the band members on stage, backstage, and inside their own homes. Another section of the book features private photographs personally taken by Jon, giving fans a unique look - for the first time ever - at the rock icon's life through his own eyes.